← What is a Handcrafted Log Home? Some years ago, when I worked at Frontier Builders in Land O’ Lakes, Wisconsin, company founder Jerry Wait and myself were out looking at buying stumpage when we stopped by a log home under construction. system and, at the time, I was contemplating the type of roof to put on a small log home I was completing for myself. The roof design he used was simple: first he covered the ridge and purlins with 2” x 6” T&G decking; rigid insulation was laid on top of the T&G; and 2” by 2” sleepers were laid on top of that. Long screws that penetrated through the insulation anchored the sleepers to the T&G decking and hold the insulation in place. Sheathing was then fastened to the sleepers. Tarpaper and shingles completed the job. During the drive back to the log yard, I asked Jerry what he thought of this building method. “There’s no structure,” he replied. that was developed when words used to cost a nickel each. And come to think of it, there isn’t much more to say on the subject. 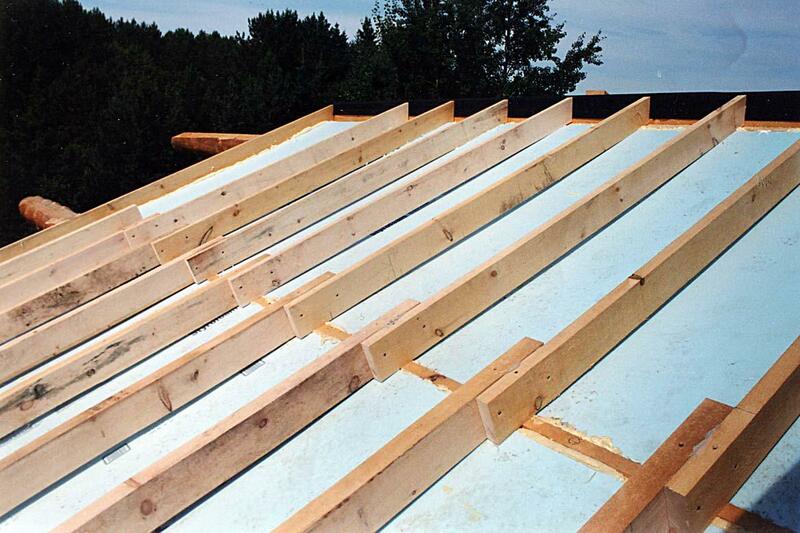 SIPs, after the first winter in the home, I had something called “shingle ridging.” That’s caused when moisture migrates through panel joints and causes the OSB to expand and push up the shingles. Although the situation usually reverses itself after summer heat, the ridging will repeat every year—not a healthy situation in the long term. I’ve since sold that small log home, but the subject of roofs was a concern again last year on another home for me. I remembered Jerry’s concerns about sleepers and combined that with what I knew about SIPs and came up with something I call a “modified rafter” roof system. The following method was used on a cathedral ceiling that covers a 20’ by 30’ wing. It’s strong, can be vented or un-vented, and has an extremely high R-value (mine is approximately R-55). Although it’s a labor intensive roof to build, I believe it has high economical value and high structural integrity. Living in the snow country in Michigan’s Upper Peninsula, we receive an average of 250 inches of white stuff per year. So the roof had to be stronger than your average one, and since I have a penchant for working alone, the process had to be solo friendly. 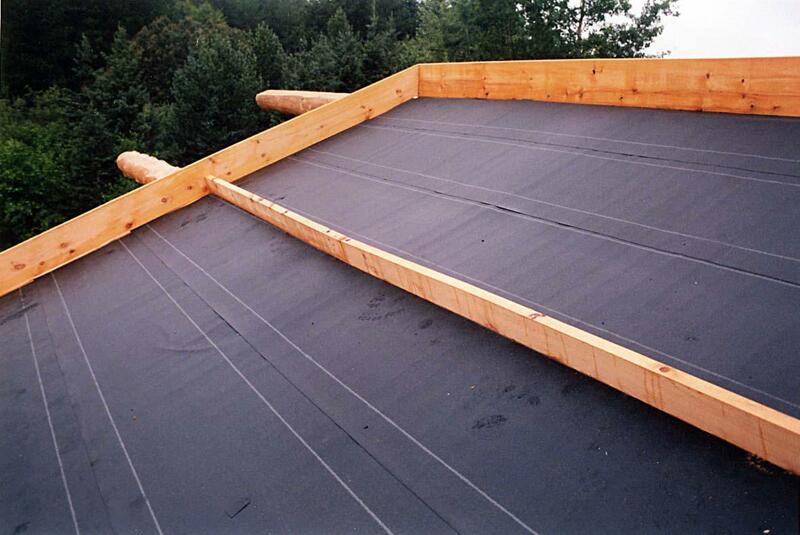 -The key to this style of roof is the 16-inch Oly Log Fasteners purchased through Schroeder’s Log Home Supply. They hold the rafters directly to the ridge and purlins. Don’t skimp on screws (GRK Fasteners also work) or you’ll be the one who gets screwed in the end. -This same roof design would be excellent for professional spray-in foam insulation applications such as Icynene. Although I considered it, the nearest contractor is 150 miles away and it was easer and perhaps a bit less expensive to use sheets of insulation. This entry was posted in Bill Olsen, Log Builders, Log Building Tips, Techniques and tagged building tips. Bookmark the permalink. Great system! Would you repost on logfrogs.com/blog?